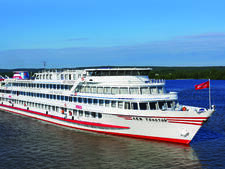 The 212-passenger MS Rostropovich -- named after the famous Russian cellist and conductor -- is one of nine ships in the international fleet run by Vodohod, the largest river cruise operator in Russia. 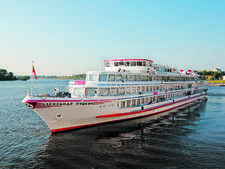 Vodohod, which was founded in 2004 and used the brand name Best Russian Cruises, purchased the Czech-built vessel and had it completely refurbished in Russia. It is branded as a one of the line's two "five star" ships, and although the decor in some areas is a little old fashioned, it is a very comfortable vessel with a very light and airy atrium -- a marked contrast to some of the rather dark and gloomy vessels that also ply the Russian waterways. All cabins on the four-deck ship are outside and those on the upper three decks have sizable balconies -- a standout feature for a river vessel. Ships in Russia are not limited in size in the same way as those sailing on rivers with low bridges and narrow locks, such as the Rhine and Danube, and are therefore much more spacious. As a result, many of the 106 cabins -- which range in size from 125 square feet to 322 square feet -- are much larger than you would find on ships sailing on other European waterways. The ship never feels crowded. 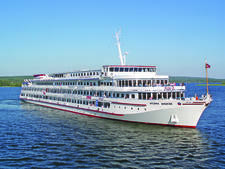 Cruises on MS Rostropovich are sold through tour operators, including U.S.-based Gate I Travel, and offer excellent value-for-money, particularly for passengers seeking a really in-depth and cultural Russian experience. The onboard enrichment progam is outstanding, covering everything from a light-hearted Russian doll painting class and a vodka tasting tea party to poetry recitals and illuminating talks on all aspects of Russian history, politics, economics and day-to-day life. The ship has two restaurants, two lounges and amenities including a small gym and game room. It also has an elevator serving all four passenger decks, including the Sun Deck -- another big plus for a rivership -- and offers free Wi-Fi. The main onboard languages are English and French and announcements, menus and printed information is in English. There is a dedicated English-speaking host who accompanies passengers on shore excursions and is always available to help and answer any questions. 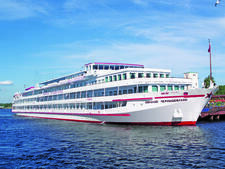 MS Rostropovich sails on the Moscow Canal, Volga and Russian waterways, most typically a seven-night itinerary between Moscow and Saint Petersburg or in reverse, from May to October. 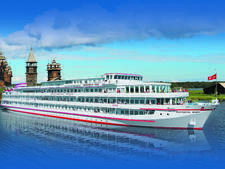 Vodohod attracts a very international audience and -- for river cruising -- a broad age range of passengers. The majority are over the age of 50 -- mainly couples, groups of friends and some singles. However, the line also attracts multigenerational families with children. Vodohod has a partnership with the French-owned river cruise line CroisiEurope so the French tend to make up the largest single nationality. The rest of the passengers will come from a variety of countries around the world so your shipmates might include travelers from the U.S., U.K. and mainland Europe, Hong Kong and Brazil, to name just a few. This creates a very cosmopolitan onboard atmosphere. There is no set dress code and most passengers opt for casual attire. Most tours involve a considerable amount of walking, so comfortable walking shoes or sneakers are essential. 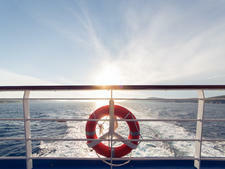 Jeans, casual pants, T-shirts and sweaters are ideal to wear onboard and for shore excursions. Weather in Russia can be changeable, even in summer, so it is a good idea to bring layers, plus a hat, light rain jacket and umbrella. It is important to note that visits to Orthodox churches and monasteries requires observing certain regulations, such as wearing pants for men -- no shorts -- and longer dresses or pants for women and tops that cover shoulders and upper parts of the arm. In theory, headscarves should also be worn but this didn't appear to be enforced. Many religious sites also have scarves at the entrance that women can borrow freely. To be on the safe side, it is best to carry one in your purse or rucksack. Evenings on the ship tend to be smart casual, but there is no requirement to dress up and some passengers wear jeans and T-shirts while others change into something a little smarter. For dressier occasions, such as the captain's dinner or evening out at a concert or ballet, some women wear elegant dresses and men put on dress shirts -- some with ties -- and jackets. Vodohod fares cover all meals and snacks, daily excursions, two daily bottles of water per cabin (which can be topped up from a water cooler), Wi-Fi and the services of a dedicated English-speaking host. The onboard currency is the Russian ruble. Gratuities are not included in the fare and tips are discretionary with the recommended amount the equivalent of $12 per person, per day, which is shared equally between crew members. Tips have to be paid in cash and left in the designated box, which is put on the reception desk a few days before the end of the sailing. Passengers are also welcome to tip individual crew members direct. Many nationalities do not share the same tipping culture as North Americans and there are no guidelines for tipping local guides and drivers who do not openly expect tips. If American passengers wish to give a small amount in local currency, it will be accepted with gratitude. Currency exchange is not available onboard and passengers can exchange cash at banks in large towns and cities (banks may require you to show your passport) or withdraw money from ATMs that can be found in all the larger destinations visited. MS Rostropovich operates a cashless system -- aside from laundry services -- and all onboard expenditures, such as in the bar and shop, are added to the ship's account by using the red payment card, which is separate to the cabin keycard. Final accounts can be settled by Mastercard or Visa. Cash payments can only be made in rubles. Note: American Express is not accepted. Georgy Chicherin was built in Germany in 1984. Named after a famous Marxist revolutionary and Soviet politician, this ship underwent a full refurbishment in 2011. Vodohod's 160-passenger Lev Tolstoy -- named after the famous Russian novelist -- features all outside cabins with en suite bathrooms and air conditioning. 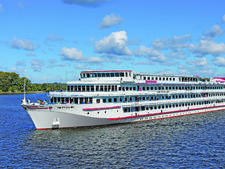 Zosima Shashkov, part of Vodohods fleet of river cruise ships, is a four-deck vessel that has been purpose-built for sailing along the waterways of Europe. This vessel, which bears the name of a minister of the Sea and River Fleet of the USSR, was built in 1986 and can hold up to 296 passengers. The 254-passenger Nikolay Chernishevsky, part of Vodohod's growing river fleet, was built in Germany in 1981 and underwent a full refurbishment in 2012. Vodohod's Alexander Pushkin bears the name of one of Russia's most celebrated poets. Built in 1974, it can hold up to 160 passengers. Vodohod's Konstantin Fedin was built in Germany in 1980, and fully refurbished in 2011. 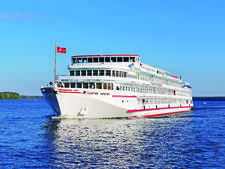 The river ship has the capacity to accommodate 250 passengers. Vodohod's Maxim Gorky was built in Austria in 1974. Named after a famous Soviet writer, this ship underwent an extensive refurbishment in 2002 to upgrade its facilities. Russ is specifically constructed to navigate European waterways. Named after an ancestor state of Russia, the 1987-built ship carries up to 288 passengers. 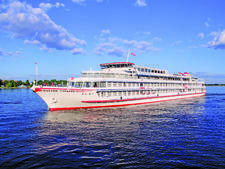 A classic Russian river cruiser on the Volga, Kronshtadt combines a modern refit with authentic local charm.